During their ‘Star Trek’ careers, both William Shatner and the late Leonard Nimoy made various excursions into the musical world with mixed responses. Nimoy gave the world ‘The Ballad Of Bilbo Baggins’, while Shatner’s melodramatic cover of Elton John’s ‘Rocket Man’ had to be heard to be truly believed. But one noted musical offshoot inspired by the long running franchise were a bunch of Swedes who traded under the moniker of S.P.O.C.K – alongside bands such as PAGE, ELEGANT MACHINERY and SISTA MANNEN Å JORDEN, they were to become key players in the Swedish electronic pop scene. The project started in 1988 when Eddie Bengtsson of Svenske synth trailblazers PAGE put together some ‘Star Trek’ themed songs for his friend Finn Albertsson to perform at his birthday party; another friend Alexander Hofman provided the vocal accompaniment. 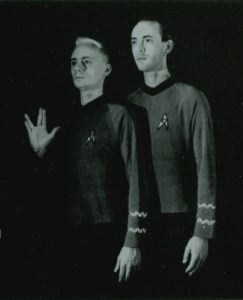 Calling themselves MR SPOCK, the performance was well-received and unexpectedly led to further local live bookings with Bengtsson now also incorporated into the line-up. Formal approaches were made to Paramount Pictures to use the name of the Vulcan Science Officer, but unable to reach agreement with the studio giant, the trio opted to call themselves STAR PILOTS ON CHANNEL K, otherwise abbreviated to S.P.O.C.K. Releasing their debut single ‘Silicon Dream’ in 1990, the S.P.O.C.K crew adopted character personas with Hofman, Bengtsson and Albertsson calling themselves Android, Captain Eddie B Kirk and Cybernoid respectively to fully immerse themselves into their conceptual vision. 1992 saw the release of their signature song ‘Never Trust A Klingon’ on Energy Rekords. A frantic robotic synthpop number with a hypnotic dance feel, Hofman’s detached but theatrical vocal style told the message loud and clear. A magnificent blip splurge in the middle eight was further enhanced with samples of Captain James Tiberius Kirk from ‘Star Trek III: The Search for Spock’ . ‘Never Trust A Klingon’ bordered on nerdiness, but presented with a straight face and accompanied by a brilliant synthetic backing track, it strangely came over as a work of genius even with lines about “evil barbarians” who “if you ever give them a helping hand… can be sure they’ll chop off the arm”. Klingons on the starboard bow? THE FIRM’s 1987 novelty hit ‘Star Trekkin’ this most certainly wasn’t and ‘Never Trust A Klingon’ became an alternative club favourite in both Sweden and Germany. The parent long player ‘Five Year Mission’ appeared in 1994. Predominantly based around the cult of ‘Star Trek’, it began by exploring the ‘Neutral Zone’ in a steadfast ERASURE-ish recollection of a mission where the USS Enterprise responded to a distress call sent from the no-man’s land dividing The Federation from The Klingon Empire. Continuing the Trekkie theme, ‘Mr Spock’s Brain’ utilised Android’s processed Numan-esque drone with some enjoyably daft lyrics, while the bleeps and chattering drum machines on ‘Charlie X’ accompanied the story of a disturbed teenager who appeared in a first season episode causing mayhem aboard the Enterprise while stalking one of the female crew members. But it was a story that could be related to any aspect of society, not just in outer space. The deadpan drama of ‘Black Hole’ saw the USS Enterprise trying to get more warp speed to prevent being sucked into oblivion, while ‘Edge Of Forever’ with its distinctive tones of mechanical vocal expression was great spacey Eurocentric synthpop. 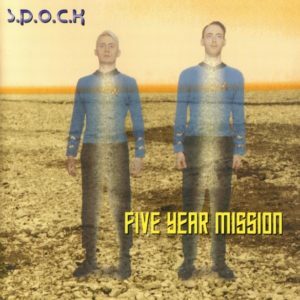 Despite the concept of ‘Five Year Mission’, not all the tracks were based around ‘Star Trek’ but most were still Science Fiction based. ‘Space Race’ borrowed from Vince Clarke-era DEPECHE MODE and S.P.O.C.K were later to pay tribute to Basildon’s most famous sons when they recorded ‘Ice Machine’ for the Svenske DM tribute ‘Sometimes I Wish I Was Famous’. Meanwhile ‘E-Lectric’ celebrated future technologies in a typically Kling Klang fashion and the HG Wells inspired ‘Time Machine’ told of a trapped time traveller whose survival supplies were running on empty. ‘Five Year Mission’ ended appropriately enough with ‘Last Man On Earth’, a dystopian doomscape about machines taking over the earth. “The robots are now out of control” muttered Android dispassionately in a tone that could have easily come from TUBEWAY ARMY’s ‘Replicas’. S.P.O.C.K’s music could on first impression be seen as bordering on parody. But expanding on the sly deadpan humour of KRAFTWERK and combining it with Bengtsson’s melodic synth laden compositions, S.P.O.C.K’s music possessed enough authentic weight to complement Hofman’s amusing wordplay. In a period when the UK had more or less given up on synthpop and Britpop was rearing its ugly head, Sweden and Germany were still keeping the genre alive on ‘Planet Earth’. Rather fittingly, the inter-galactic adventures of S.P.O.C.K would later lead them to reinterpret that same titled DURAN DURAN track for the ‘To Cut A Long Story Short’ synthpop covers collection in 1995 alongside ELEGANT MACHINERY and PAGE. Posted in Lost Albums	Tagged with PageS.P.O.C.K.